True orthodontic emergencies are rare, but we are available to you when they occur. As a general rule, you should call our office when you experience severe pain or have an uncomfortable problem you can't take care of yourself. If it is a night or weekend after normal office hours, call the office and there will be an emergency number on the voicemail. You might be surprised to learn that you may be able to temporarily solve many problems yourself until you can get to our office. If there is a loose brace that you can remove, put it in a plastic bag and bring it with you to your next appointment. If a wire is poking you, you can try to clip it with fingernail clippers or any kind of wire cutter, or you can put wax on the wire until you can get into the office. If the wire has come out of the very back bracket, you can try to put it back in by inserting it into the "tube." 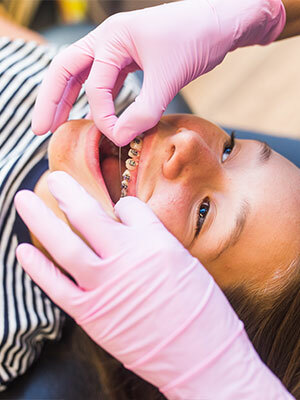 When you first get your braces, you may notice that your teeth and mouth feel a little tender or sore, especially with pressure from chewing. This is perfectly normal and we promise your mouth will not be sore forever! For tooth pain, stick to a soft diet and take a pain reliever such as Tylenol every six hours. The lips, cheeks, and tongue may become irritated for one to two weeks as they become accustomed to the surface of the braces. You can put a small amount of wax on the braces to lessen this...we'll show you how! You can also use any mouth sore gel such as Orajel or Orabase for temporary relief. If your bracket is still attached to the wire, you should leave it in place and put wax on it if needed for comfort. If the bracket can be removed easily, place it in an plastic bag and bring it to your next appointment. If the wire comes out of the very back bracket, you can use a pair of tweezers or needle-nosed pliers to put your wire back into the tube. If you are unable to put it back in the tube, you can clip the long wire with fingernail clippers or any kind of wire cutter. If the loose wire is causing irritation to your lips or cheeks and you are unable to clip it, put a small amount of wax over the poking wire until we can see you in the office.